Rajnikanth - "perra ketta chumma adhiruthula" - is one man who's loved by everyone all over the world. We just saw the response on twitter when he joined few days back. He was among the top 10 celebrities in the world to get many followers in a single day. And, needless to say he is the number one among Indians with maximum followers on a single day. Well, who am I kidding with introduction for this living legend; the name Rajnikanth is just enough. Rajnikanth, who started acting in the black and white era, has a movie scheduled to be released in motion capture technology. I don't think many other actors could achieve this feat of acting in Black & White era, in colour, in a 3D movie, and now in a movie in motion capture technology. Rajnikanth has reached a point in his film career where he is not going to act as many movies as he used to - we may get to see a new Superstar movie once in a year or in two years. So now the question is what kind of movies should we expect from our Superstar. Do we need commercial movies like Sivaji or technically brilliant movies like Enthiran? If you ask his fans to list their favourite Rajnikanth movies, I am sure Sivajis and Padaiyappas will find a place higher than Enthirans. Now as we wait for his next release Kochadaiyaan, he has already begun his next, Lingaa with K S Ravikumar. We all know what we can expect from this combo, another movie which will be on the lines of Padaiyappa. I am also as excited as any other Rajinikanth fan would be about this movie, but I will be even more excited had his next movie been Enthiran 2. Because of him, we have had a technically brilliant sci-fi genre film. Also, the first ever movie with motion capture technology in India is also going to be from Tamil cinema industry - thanks to Superstar once again. Bottom line - The producers will be happy enough to invest on new technology and high budget films if it has Rajinikanth. 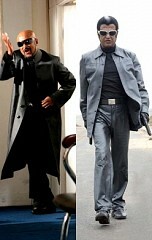 We all know how much the Rajinikanth factor contributed to the high budgeted Enthiran’s success. So now what I feel is Rajinikanth must make movies like Enthiran and Kochadaiyaan rather than commercial movies. We have many other heroes in Tamil cinema industry who can give us commercial movies. I strongly feel producers will be happy to invest big easily on Rajinikanth - so he must choose some scripts which can take Tamil cinema to a different level rather than choosing normal commercial movies. I just wish to see more experiments and high budgeted movies from Tamil cinema, and with Superstar the wish definitely seems possible.